Heil Sound is pleased to introduce The Fin, exhibiting a remarkable, natural, clear sound and designed especially for live sound, recording and broadcast applications. The exceptional performance is achieved by the use of a special magnet structure with a large 1 1/18" aluminum low mass voice coil assembly similar to the Heil PR 20. The frequency response is 60 Hz - 18kHz with that traditional Heil Sound mid range 'bouquet' at 4kHz, which presents incredible brilliance and presence. The Fin exhibits a tight linear cardioid pattern. The chrome finish is a special 'showchrome' where the steel body is copper plated and then double chrome plated producing a deep chrome finish. A blue molded internal foam windscreen inside the grill covers the large diameter Heil dynamic microphone element mounted in a specially tooled Sorbothane © shock mount. The fun part of The Fin is the four blue L.E.D. lamps mounted inside. These can only be illuminated when using The Fin into one of the 3 pin balanced XLR inputs of a professional mixing console that supplies a + 48 volt d.c. phantom voltage down the balanced mic line. A small slide switch on the bottom of The Fin must be switched to 'ON'. 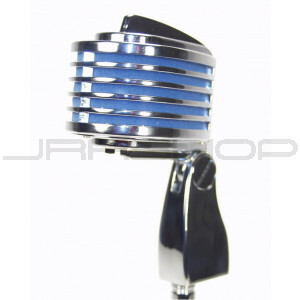 Standard 5/8" – 27 microphone stand threads allow The Fin to be mounted on booms or floor stands. Four blue LEDs, driven by 48V phantom power, light up when the switch on the bottom of the mic is "On"